It’s a twisty bumpy road getting there, and it’s a relatively easy hike to get into, but the getting back can cause a little exertion due to the fact that you’re climbing out of a relatively steep canyon. At just over 6-miles round trip, it’s a nice hike and one worth putting on your list. How to get there: On Hwy. 126 between Redmond and Sisters take Goodrich Road (Goodrich only goes in one direction) and drive for about 8 miles along a winding paved road. At milepost 7, turn left on gravel road 6360 and pass through a green gate. Prepare for some bumps and ruts in the road for the next 4 miles, until you get to the “Alder Springs” sign where you turn right. After that you’ll take a really rough rocky road for just short of a mile to a parking turnaround. Whalla! You’re there! We drove out in a sedan, so even though there a quite a few high and low spots in the road, I think most any vehicle can get there as long as you don’t go too fast. Before embarking on this hike be sure to prepare to cross a mid-to-knee deep creek. In the early spring Whychus Creek is pretty deep, but very passable providing you have the proper footwear and you’re not toting a mid-sized and/or antique dog (as was the case the day we hiked). Once you’re there it’s wide open with views all around. The trail starts out flat and travels over the desert until you begin to crest the canyon. From there the walk slowly descends to the floor of the canyon passing some really gorgeous rimrocks and loads of tall trees and green vegetation. The lower down towards the water sources you get, the cooler the temps, which is something you’ll certainly appreciate once you start hiking back out of the canyon, particularly if you’re hiking in the heat of the summertime. Having a snap-happy trigger finger on my camera, this hike afforded loads of opportunity to take photos and to enjoy the play of light and shadow on the rocky outcroppings and along the trail. 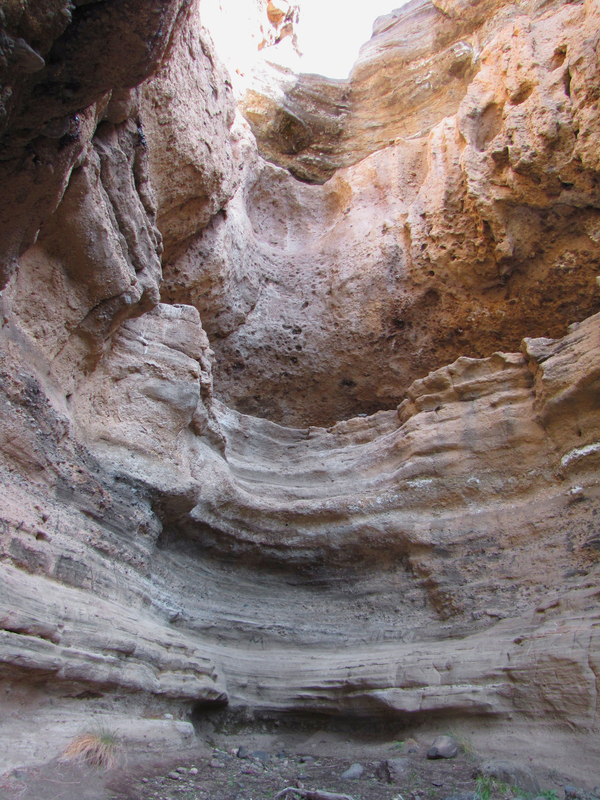 One unique spot was where the cliff side creates a deep opening in a hollow cavern where you can step inside and see the many geological layers of sediment and stone that created the unique landscape of the area. 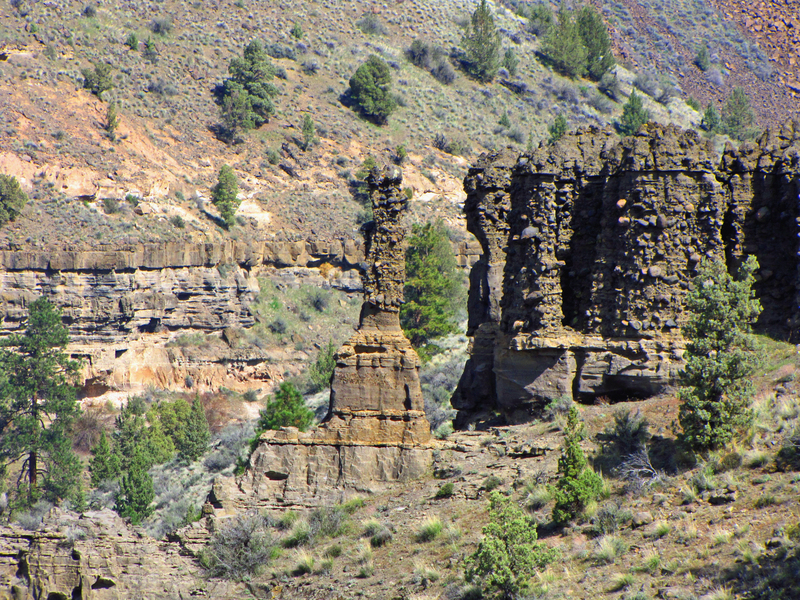 The sides of the canyon have eroded into a number of interested hoodoos, pillars and jutting rocky ledges all along the way with all kinds of color and textures at play depending on the time of day and angle of the sun in the sky. 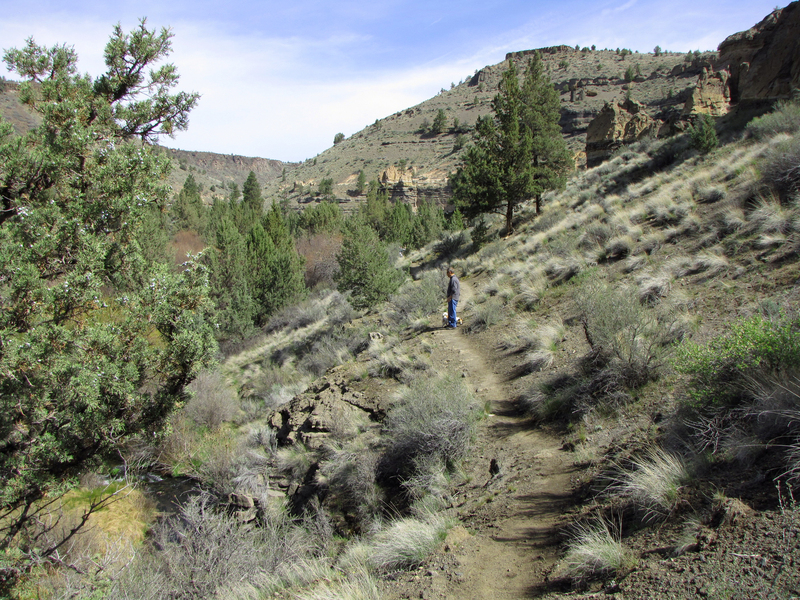 The last mile and half or so of this hike happens after you cross Whycus Creek and then it dead-ends at the ultra scenic Deschutes River, in which you and the pooch can actually take a quick cool-off if you’re so inclined. The hike back out is just as beautiful as the hike into, and the incline towards the top is sure to give you at least a moderate workout. What you’ll see: depending on the day of the week, a lot of hikers and photographers and a few hiker dogs, birds of prey and smaller birds, lizards, and reportedly rattlers along the way – oh, and lots of big stinky cows on the drive in before you pass over the cattle guard.